I've tried to write this review a few times and either decided against it until I'd tried a few more vinegary ideas or got distracted while following through on these tips. So here I am, finally sitting down with my computer, to share with you something that has kept me busy for the last few days. Now for the meat of the book... I started reading a little too late on a Thursday night, so I only made it to Chapter 8 before turning out my light. The next morning I had a house to clean with my company, The Cleaner Sweep. (For those that are not familiar with The Cleaner Sweep, we clean houses using natural, toxin-free cleaning products.) I found myself thinking about all the tips I had read the night before, chastising myself for not bringing a gallon of vinegar along with me. At one point, I couldn't control myself any longer and mentioned to the client (who obviously enjoys toxin-free cleaning) that she could clean her jacuzzi with vinegar. She smiled and said she was already doing that. After finishing the book later that day, I found myself very satisfied with the wealth of information and personal experience available to me through this book. And it's not just the book, but the accessibility of the author. Hana really cares about her readers and can be found on Facebook each day, interacting with other green folks. She's created a very nice community that goes beyond her book. But back to the book... I found tips in here for everything! I was so excited to go to my local grocery store and buy some Apple Cider Vinegar (ACV), raw and organic of course since all those good enzymes are still in there. It's supposed to be great for your body (weight/fat loss, colds, digestion, cramps, heartburn, hot flashes, insomnia, and the list goes on) when taken daily. I've already had an ACV tea party with my daughter and we're planning many more. There are so many tips in this book for cleaning your house. You can clean virtually anything with Distilled White Vinegar (DWV)! The first tip I tried was to clean my shower-head with a rag soaked in vinegar. I left it on for a couple hours while I was busy in another part of the house and when I came back and gave a quick swipe all the gunk was gone. I'm guessing that was about 35 years of gunk since I've never been able to get it that clean before and that's how long this house has been accumulating gunk. I've cleaned my coffee maker and dishwasher with vinegar, with great results. I deodorized and fabric-softened a load of sheets (that got anointed by my young son through the night) with vinegar. I've cleaned my drains with it and removed longstanding cat odours from carpet with it. I have yet to try the other cleaning tips but she suggests vinegar for windows, walls, fridges, stoves, microwaves, carpet stains and so on. There was one thing that I tried that I'm just not sure about. There are quite a few “no'poo”ers out there who are shampoo-free and only using baking soda and vinegar to clean their hair. 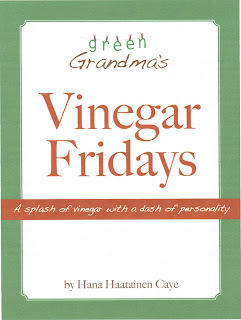 I tried it for one day and then gave up, so I'm not a very good person to give a review on this part of vinegar. But I'm planning to try again. I'll ease my way into it and research it a little more to find out what will work best for my hair type and water type before I try again. I would also have loved to see an index in the book. This kind of book is great to have around since it has helpful hints for so many different things and an index would have made these tips all the more accessible. Perhaps Hana can include an index in a revised edition five years from now. (Inside joke. You had to read the book.) In the meantime, pick up a copy if you can. The price tag may seem a little steep for such a small (but mighty) book, but it's so worth it since you will save that much money in one month if you make just a few changes around your house using these vinegar tips. You can purchase Green Grandma's Vinegar Fridays here. What a wonderful recommendation. I'm already using vinegar for my laundry. I'll have to check out the book to see what else I can use it for. Thank you! Thank you for this lovely review, Wanda! If I hadn't written the book, I'd definitely buy it after reading this review!